SanDisk Corporation and Sony Corporation today announced the joint development of two expanded formats that will shape the flash memory landscape for years to come. 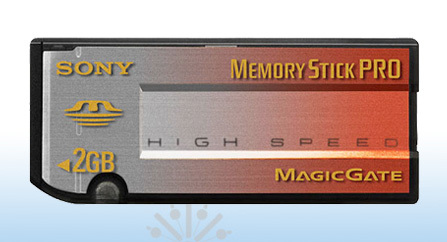 “Memory Stick format for Extended High Capacity Tentative name)”expands the Memory Stick PRO format series to achieve a maximum storage capacity of 2 terabytes (TB)*１, while the “Memory Stick HG Micro” format enables a maximum data-transfer speed of 60 megabytes per second (MB/s)*2, making it one of the fastest smallest memory card formats to date. Format licensing corresponding to the “Memory Stick format for Extended High Capacity” and the “Memory Stick HG Micro” is scheduled to start in 2009. “Memory Stick HG Micro” In addition, SanDisk and Sony today announced the joint development of “Memory Stick HG Micro”,c a format expanded from “Memory Stick Micro” (M2). This new format adopts an enhanced 8-bit parallel interface and features an increased interface clock frequency of 60 megahertz (MHz), enabling 60MB/s (480 Mbps in theoretical value) maximum data transfer speed. This is three times faster than the conventional serial 4-bit parallel interface and 40MHz interface clock frequency adopted in the “Memory Stick Micro”, offering data-transfer speeds of the “Memory Stick PRO-HG” on a micro-size memory card, Since the September 1998 market introduction of the “Memory Stick,” cumulative shipments of media are estimated to surpass 500 million units*5 in 2009. SanDisk and Sony will continue to work toward enhanced usability of the “Memory Stick” to respond to the market needs for larger and faster memory cards.